When you learn how to make ham sandwich recipes, you will find they are the most popular of all sandwiches because of the variety of ways they can be made. Imaginative sandwich makers will vary the possibilities of many different types of ingredients combined in the fillings. 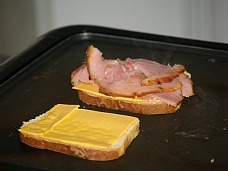 They can range from a simple slice of ham between two slices of bread to very elaborate sandwiches. Vegetables and sauces can be added to the ham slice or delicious fillings can be used to spread on the breads. Also when learning how to make ham sandwich recipes, many different types of breads can be used to add flavor and make them more interesting. Due to the mild flavor of ham, many other bread flavors can be combined with it. Some of the great breads to use besides a basic white bread recipe are Boston brown, raisin, rye, multi grain and whole wheat. Homemade thinly sliced nut, orange and date breads with thinly sliced ham makes unique and tasty sandwiches. Muffins, soft rolls or buns and croissants also make delicious sandwiches. If you are learning how to make ham sandwich recipes, do not forget many of them are ham roll-ups made with tortillas. When using white bread for ham roll ups, buy an uncut loaf and make long even slices the length of the loaf. Pita bread makes delicious and unique sandwiches; all kinds of ingredients can be added to the ham to make a variety of different taste. Combine ham, cream cheese, mayonnaise, onions and olives; blend well. Spread a layer of mixture over tortilla; tightly roll up tortilla and wrap individually in plastic wrap. Place in refrigerator for several hours; cut in ¾ inch pieces to serve. 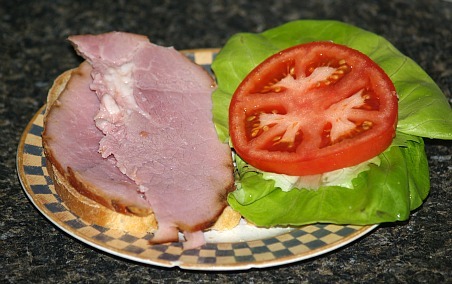 This is one of the easy ham sandwich recipes which can be made in advance and frozen until needed. Melt butter; add mustard, onion, poppy seeds and Worcestershire sauce. Mix ingredients until well blended; refrigerate until mixture is spreadable. Cover tops and bottoms of buns with butter mixture; add ham slices and cheese slices. Wrap individually (each bun half) in foil; freeze until needed. When ready to serve, (life foil up off of cheese slice) place sandwiches in oven at 350F degrees and bake 30 minutes. Combine all ingredients and blend; toast one side of slices of bread. Spread filling on untoasted side of bread; place under broiler until lightly browned. Butter slices of bread on one side; lay on tray or wax paper butter side down. Place a slice of American cheese on half of slices; on unbuttered side. 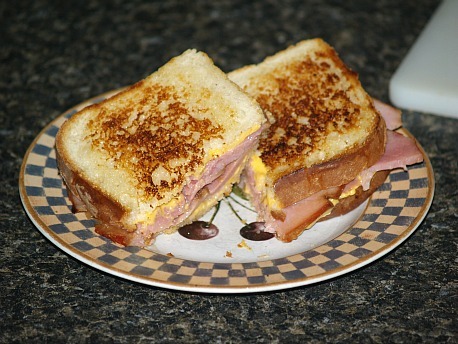 Place a slice of cooked ham on top of cheese; then top with another slice of American cheese. Top with other half of buttered bread; unbuttered facing cheese. 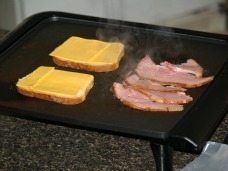 Place sandwiches on medium hot griddle until brown; turn sandwiches over and brown on other side. Separate yolks and whites of eggs; force yolks through a sieve. Add chives seasonings and mayonnaise to yolks; beat to a smooth paste. Chop egg whites and ham together; blend in with the yolks mixture and spread on bread. Combine all ingredients and blend; spread on bread. This pita is also considered one of the ham salad sandwich recipes. Combine and mix well; serve with pitas.